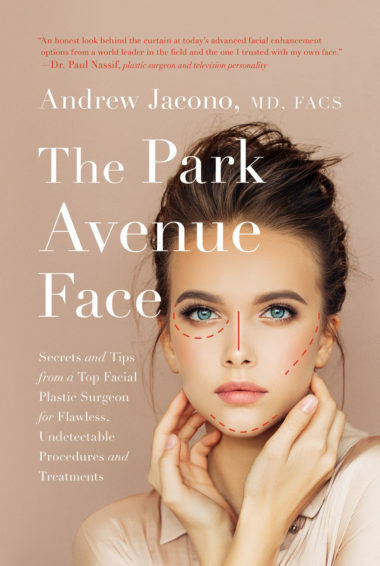 Dr. Andrew Jacono, a top Park Avenue plastic surgeon, provides an extensive guide to facial cosmetic procedures, including what to avoid and how to ensure the end results look completely natural. Your face defines you. It influences how people perceive you at work, at play, and even at home–in person and online. Your face should reflect exactly who you are. But what if something about your face doesn’t make you feel like the real you? In The Park Avenue Face, dual board-certified facial plastic and reconstructive surgeon Dr. Andrew Jacono reveals how to achieve flawless, undetectable plastic surgery so you can fix what you don’t like, restore what you’ve lost, or prevent signs of aging—to ensure that you love your face. From his elite Park Avenue aesthetic surgery center, Dr. Jacono has enhanced tens of thousands of faces not by prescribing an arbitrary standard of beauty, but by amplifying each patient’s individual beauty for totally natural results. A global authority in advanced facial plastic surgery, he has presented clinical research and conducted live surgery in front of peer audiences at over 100 plastic surgery symposiums around the world, including at Harvard, Yale and Stanford Universities. Now, he’s ready to share his expertise with you. High-end Park Avenue clients want to fight the signs of aging while highlighting their best features. They want lips that look like their own lips, eyes that look like their own eyes. They want facial features in line with their ethnicities. Park Avenue clients want to look powerful yet approachable, wise yet fresh, and above all, natural. With Dr. Andrew Jacono’s advice, you can have the Park Avenue Face no matter who you are or where you live. The Park Avenue Face also highlights a trend unique to the United States—a distinct difference between conceptions of beauty on the west coast versus the east coast. Where the West Coast Style is often about changing your personal signature, the East Coast Style prioritizes maintaining your personal signature. Through this up-close look at coastal trends, the reader will learn how to define and achieve a natural look—a face that reflects the person they have always been, and the person they strive to be, not someone they don’t recognize in the mirror. If you want a face with character and depth that looks ageless and don’t want a stretched, artificial or generic look, Dr. Jacono will show you how to get there. If you are considering any kind of facial enhancement, from minor and non-invasive treatments such as simple injections or a laser treatment to more involved surgical procedures such as a full-on facelift, this is your resource. The Park Avenue Face will show you how to avoid the quacks, the fads, the financial waste, and the dangers. Dr. Jacono will help you determine how you want to look and how best to get there. Featuring fascinating patient anecdotes, dozens of before-and-after photographs showing what the various procedures can accomplish and line drawings by veteran medical illustrator William Winn, this comprehensive guide will fully prepare you to step into a doctor’s office and discuss your facial enhancement options. You’ll know how each treatment works, how long you will take to recover, and how much change you can expect. If there is something about your face you think is holding you back—decide if making a change is right for you. Let The Park Avenue Face guide you to becoming your best you.